Posted at 8:48 pm on September 28, 2012 by Brett T.
Sounds good to us, but keep in mind this definition is brought to you by the same people who cried foul when Romney overpaid his taxes, after donating $4 million to charity. Not fair! Here’s another example of fair from the first lady’s DNC address: “Success doesn’t count unless you earn it fair and square.” As long as we’re asking for definitions, we’re a little concerned about just what she had in mind by that. 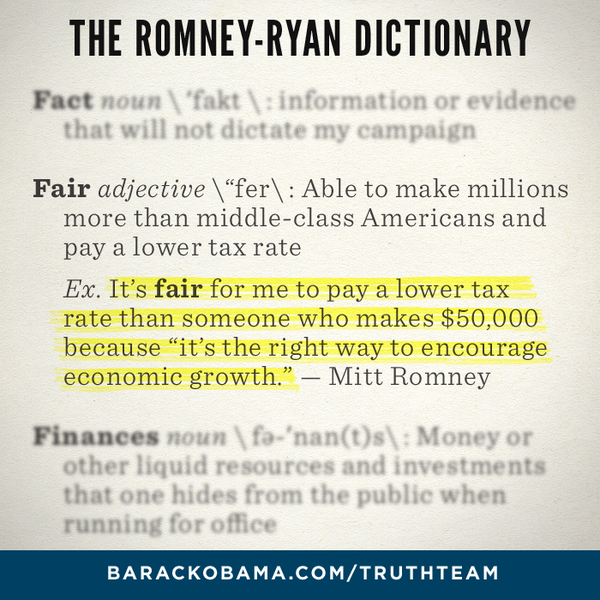 Obama dictionary, please?